This programme aims to increase our knowledge of New Zealand's epiphytes, vines and mistletoes. We encourage people from all walks of life to get involved and contribute to our database of information on these interesting plants. Basic plant knowledge is required - if you are lacking this but keen to be involved feel free to contact us about epiphyte identification training. 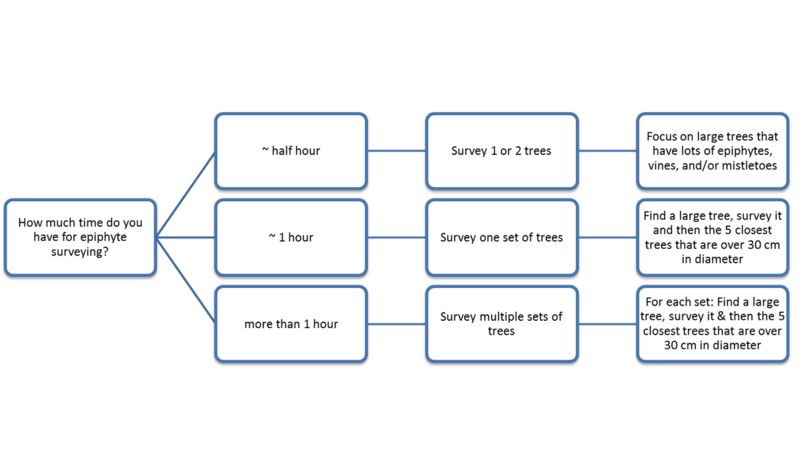 Using the blue flow chart below, decide how many trees you want to survey. The times indicated are for once-off surveys, there is no commitment to survey regularly. Head into the bush and survey as many trees as you like!